Please note that this webinar will take place in French. As more and more companies struggle to engage employees on intranets and enterprise social networks; the secret to real engagement lies in implementing tools that put employees themselves at the forefront of internal communication. From bottom-up initiatives to mobility, user-generated content (UGC) and gamification, internal communication is a key element of digital transformation. 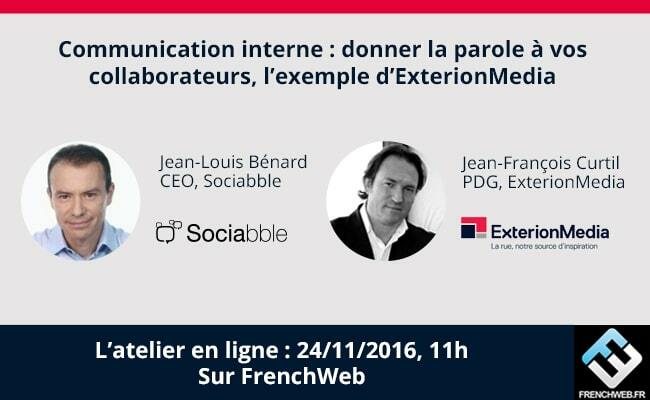 Join Jean-Louis Bénard, CEO from Sociabble, and Jean-François Curtil, President at ExterionMedia, to discover how to engage employees by empowering them as the principal drivers of internal communication within your organization.